"The fact that the body is lying down is no reason for supposing that the mind is at peace. Rest is... far from restful" (Seneca, 1969; Snyder and Raichle, 2009). The brain's resting state is best defined as something like stimulus-independent intrinsic activity. This intrinsic activity is present in animals and humans even during anaesthesia. In you and me, you can liken it to unconstrained thoughts or cognition - like what the brain is doing while you daydream or let your mind wander. You aren't focusing on any one sensory experience in particular or even performing a particular task. Thoughts are popping into your mind and you're letting your brain do its thing. About two decades of research has shown that when measuring this unconstrained thought process of a person simply lying in the MRI scanner, activity in various brain areas are surprisingly in sync - that is, they show similar patterns of up and down activation over time. These areas have an intrinsic ability to fluctuate together and form separate, independent networks, which can be measured with multiple methods like fMRI or EEG. Eyes closed, eyes open, no bother - even differential ruminations between you and me are no match for the similar networks that result. That means that you can be lying in the scanner and thinking about picking up your child, while I am lying in the scanner and thinking about what I am going to eat for dinner and surprisingly, remarkably similar cortical networks are activated between the two of us. That's pretty amazing! You are not seeing double. Top: 17 resting state networks in the left and right hemispheres, respectively, from 500 individuals. Bottom: 17 resting state networks from a different group of 500 individuals. Notice the remarkable correspondence across the two groups. Image from Yeo et al., 2011. While these networks are defined based on their intrinsic functional activity, recent research is beginning to shed light on an anatomical infrastructure (e.g. white matter connections) that may provide the long-range structural wiring linking these regions together. 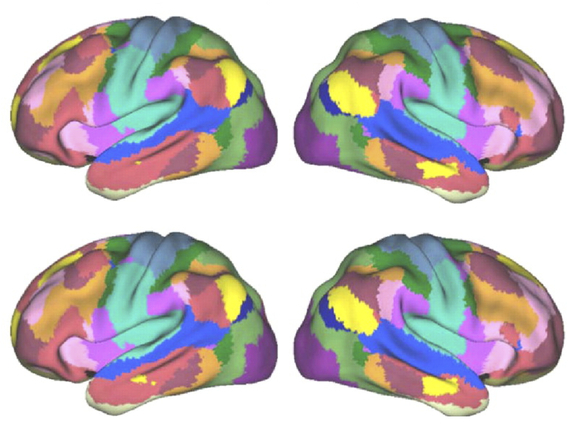 For example, Greicius and colleagues (2009) combined resting state functional connectivity with structural connectivity and found that there was a remarkable consistency between the structural and resting state connections linking regions of the brain. As researchers in the scientific community still argue about the anatomical source and validity of resting state networks, the findings from Greicius and colleagues provided evidence that resting state connectivity is consistent with an underlying anatomical basis. Present research is actively working toward understanding the similarities and differences of these networks between one individual and another. But, rest assured (pun intended), you probably share about 17 different brain networks with the author of this article and we are still actively determining how to characterize the fine-grained differences from one person to the next. So, when you close your eyes and think about whatever you want to in a particular moment in time, the networks of areas active in your brain are likely remarkably similar to someone else even though you're likely thinking about completely different things. Greicius et al. (2009). Cereb Cortex. Snyder and Raichle (2012). NeuroImage. Yeo et al. (2011). J Neurophysiol.